Valentine's Day is a chance to express your feelings to a loved one and here we give you the chance to enjoy the occasion in the romantic setting of Ischia. 20th December 2013: Overlooking the beautiful bay of Citara in Forio, the Hotel Royal Palm offers the perfect location for a romantic Valentine's getaway. With its well-equipped wellness centre and 4 thermal water swimming pools, this four star hotel comes with an on-site restaurant serving a mixture of Ischian and Italian specialities. Rooms at the hotel are decorated in a typical Mediterranean style and come with private bathrooms, fridge, satellite television and hairdryer. Our offer is for either two or three nights accommodation on a half-board basis (breakfast & dinner included, drinks excluded) and includes a vitality wellness treatment of sauna, Turkish bath, sensory shower, ice-room and relaxation area. The total price is just €135 per person for two nights or €169 for three nights between the 13th and the 16th of February, based on two people sharing a standard double room and includes return ferry tickets from Naples or Pozzuoli. 20th December 2013: The Sorriso Thermae Resort & Spa dominates the scene as it overlooks the bay of Citara in Forio and has one of the best wellness centres on the island on-site. There are a number of indoor and outdoor pools which are heated naturally by Ischia's thermal water to a range of different temperatures. 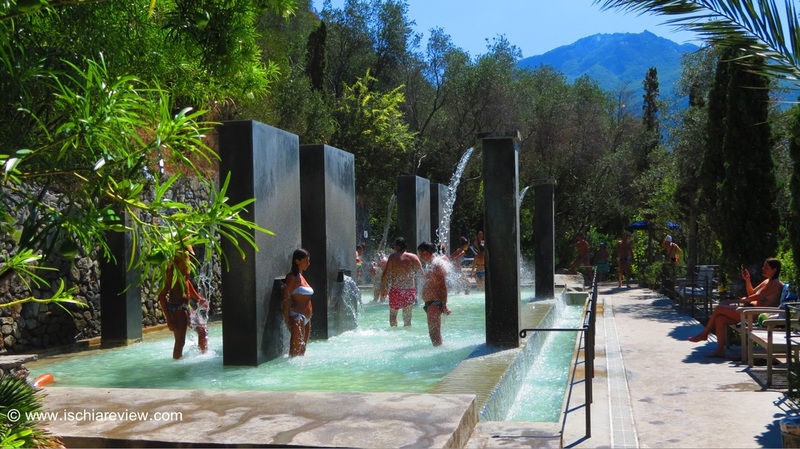 You can happily bathe outdoors at any time of year with the water temperatures reaching 38° Celcius in the warmest pool. The wellness spa is modern, sleek and attractive, offering its guests a haven of relaxation for the Christmas period. Our offer is for either two or three nights accommodation on a half-board basis (breakfast & dinner included, drinks excluded) with use of the gym, sauna and swimming pools included in the price. We also throw in a relaxing chocolate massage as well as return ferry tickets to and from Naples or Pozzuouli. The total price is just €150 per person for two nights or €187 per person for three nights between the 13th and 16th of February, based on two people sharing a standard double room. 20th December 2013: The Strand Hotel Delfini in Ischia Ponte offers one of the most romantic locations in Ischia with its position just across the water from the historic Castello Aragonese. Featuring naturally heated indoor and outdoor swimming pool using Ischia's thermal water, guests can relax and unwind with the stunning views and enjoy the excellent cuisine served at the on-site restaurant which serves a mixture of Ischian and Italian specialities. The excellent wellness spa comes with a sauna, solarium, hot-tub and Turkish bath while various massages and treatments are available. Our offer is for either two or three nights accommodation on a half-board basis (breakfast & dinner included, drinks excluded) and also includes return ferry tickets from Naples. On arrival, guests will be given a special Valentine's cocktail of champagne, strawberries and cream. We then allow you an anti-stressing chocolate body massage as well as a hydrating face-mask*. The total price is just €140 per person for two nights or €170 per person for three nights, available between the 13th February and the 16th February, based on two people sharing a standard double room.